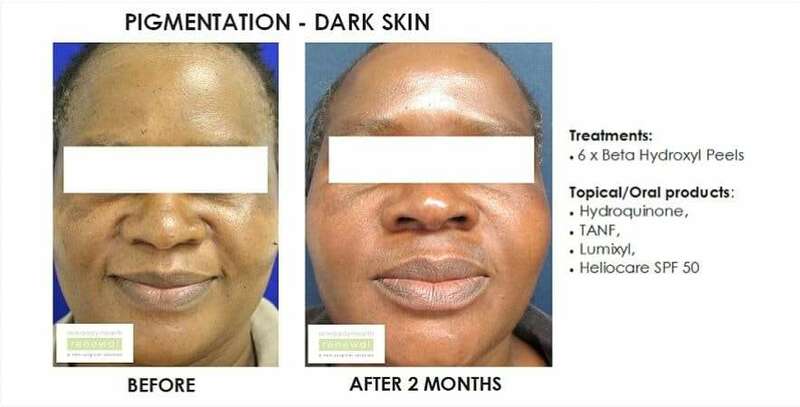 Dark skinned patients who are looking to treat acne with peels and lasers or lights would be well advised to consult with a medical doctor with experience in treating skin of colour to prevent unwanted effects such as full thickness burns, permanent scarring and post inflammatory hyperpigmentation. 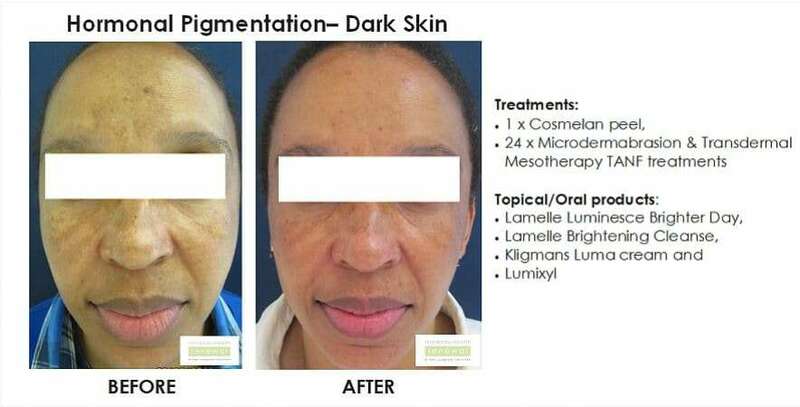 At Skin Renewal hundreds of Patients with dark skin types have been treated. Every client is provided with a fully customised solution dependant on the patient’s age, relevant skin problem and skin type, budget and expectations. Mild acne can be treated with the Clarity range which is available at all Skin Renewal branches. If you suffer from moderate to severe acne (many nodules) a consultation with one of the Skin Renewal doctors is necessary as a customized program and additional prescription medications may need to be prescribed. Is treatment for acne in Dark Skin Types available at all Skin Renewal branches ? At Skin Renewal, during your initial consultation with one of our qualified doctors, it may be advised that you are checked for low stomach acid thereafter a complimentary Betaine HCl acid test is explained and done. How does acne affect dark skin types/ people of colour? People of color are a very large group, which in South Africa includes people of African and Asian descent. It also includes patients of mixed backgrounds who have more darkly pigmented skin. Darker skin type people represent a significant and growing group of patients seeking aesthetic procedures. This is because of the increased awareness of safe, affordable aesthetic procedures. These procedures include amazing new lasers that are colour blind and are less invasive than previous generations of lasers. Yet special concerns have to be addressed when treating skin of color. Acne vulgaris, the most common skin disorder, affects virtually all individuals in all nationalities at least once. Acne mainly affects the following areas: face, neck, upper trunk, shoulders and proximal arms. Incidence peaks in 18-year-olds, but substantial numbers of 20- to 40-year-olds also develop the disease. In dark skin types, the biggest challenge is avoiding scars or marks from things such as acne and chicken pox that last for life as the pigment is so hyper-sensitive . When treating persons of color, post-inflammatory hyperpigmentation PIH (brown spots after the acne blemishes have healed) and active acne need to be differentiated. It is important to note that when one is treating acne, the brown spots that occur afterwards are only residual effects, not active acne. What are the important psychological aspects of acne in dark skin types? The effects of acne should not be underestimated. It can persist for years; produce disfigurement and permanent scarring; and have significant psychosocial consequences, including diminished self-esteem, embarrassment, social withdrawal, depression, anxiety and unemployment. The extent and severity of these effects underline the importance of providing adequate therapy, such as the new launched Clarity range by Lamelle which produces more than 80 % improvement in 8 weeks in most cases. What are the causes of acne in dark skin types? How can acne be classified in dark skin types? Acne can be classified as mild, moderate or severe inflammatory acne and is based on lesion count and whether nodules are present. This severe acne may be more common in males and this kind of acne should be referred to a Skin Renewal doctor as scarring is inevitable. How is acne treated at Skin Renewal ? At Skin Renewal we offer topical and in office therapies for acne. Topical therapies: At Skin Renewal we offer traditional topical therapies with Neostrata, Health Renewal's Acne 2 in 1 as well as Antibiotics and prescription medicines if indicated as well as Clarity™ by Lamelle- available at all Skin Renewal branches. What are the goals of successful acne topical treatments such as Clarity in dark skin types ? Topical treatment – Clarity is indicated for patients with non inflammatory comedones or mild to moderate inflammatory acne. Medications used in topical treatment may act primarily against comedones (comedolytic agents) or inflammatory lesions (antibacterial agents and antibiotics). A principal goal of therapy should be reduction or elimination of the precursor of all acne lesions— microcomedones. What are the In Office treatments available at Skin Renewal to improve and the post healing acne scarring? The Laser Genesis procedure , a 5 in one treatment , reduces the size of the sebaceous gland, reduces inflammation in the papule and nodule , reduces pore size, improves acne scarring and pigmentation-. Intralesional steroids into acne nodules reduces the acne lesion by decreasing inflammation. Pro-active staff. I came for a peel and staff arranged an appointment with the doctor> as well. I saved time and got what I needed. The doctor examined my skin when I first came to Skin Renewal in March 2014 at the Fourways branch, and the prescription she made has worked wonderfully and my skin is currently looking healthy and beautiful. It seems like a miracle has transformed my skin. She is a very pleasant person and has advised me well. Nicole has also been my therapist, she has done incredibly well with my treatment and I will continue to do my treatments with her. My overall experience at the Morningside Skin Renewal has been amazing. The treatments with beauty therapists who try to understand your skin and make suitable recommendations has been helpful. In my case, Bianca has been great. I enjoy my visits and treatments.